Successfully Added Avatar Digital Binocular Sports and Camera - Great 40x Zoom to your Shopping Cart. Digital Binocular Sports and Camera with a telescopic lens that is great for outdoor surveillance. The Avatar comes with a 2.5 inch display screen for viewing comfort and multimedia functions, including music and video player. This single lens video and photo camera is often called a "Monocular Telescopic Sports Camera". The Avatar digital camera lets you can take snap shots from one building looking out on to another building, balcony or apartment, and works best in full daylight conditions. The Avatar comes with a mini tripod and can also be fixed on a regular tripod for extra versatility. With digital 40x and manual 21x zoom function, observing your object of desire has never been more fun. In addition, the Avatar comes with a 1GB internal storage space and a micro SD card slot for extended external storage space. While waiting for your prime suspect to appear, why not use the on board media function to listen to your music using the earphones provided with the Avatar. The CVSD-DC06 telescopic camera is easy to use and can be utilized by sports fans, by private detectives or bird watchers to capture scenes scenes that are far away. 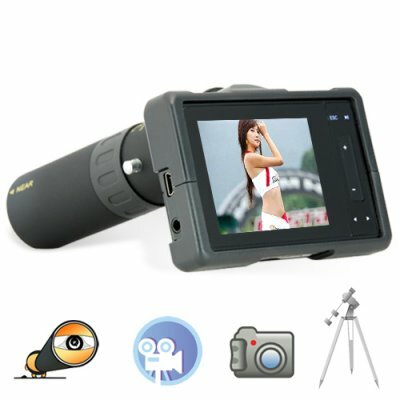 In addition, you can connect the Avatar telescopic digital camera to an LCD monitor or TV and have a more pleasurable viewing. This is a must have item to add to your extravagant camera collection. This is a professional binocular telescopic camera that comes in a compact form factor, and is available in stock for single and bulk purchases. Get your self an Avatar today and while you’re at it, get a couple more to sell on your online/physical or eBay shop. We proudly present to you the Avatar digital binocular camera with 40x Zoom function at a low factory direct wholesale price directly from Chinavasion. For best performance from your Micro SD card you should format the card for the cameras interface. This assures the best compatibility and speed. Does this camera record audio? Yes, the audio is only suitable for the person filming to take notes, not to capture audio at a distance. Do I have to turn night mode on manually? Yes. The night mode is easily accessible through the on board menu system.